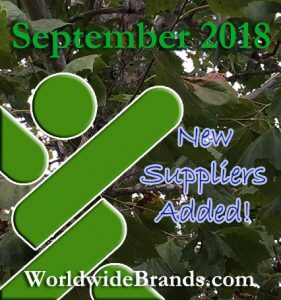 This is just a quick note to let you know what we added to the Worldwide Brands Directory of Certified Wholesalers for the month of September 2018 for our members! We added suppliers, that together, offer a total SKU count of over 85,000 SKUS! This entry was posted on Monday, October 1st, 2018 at 2:24 pm	and is filed under Wholesale Product Annoucements. You can follow any responses to this entry through the RSS 2.0 feed. You can leave a response, or trackback from your own site. Those are categories, where are the brands? Those are product types. If you are a member, you can search one of those product types, or look at the last suppliers added to view brand names.